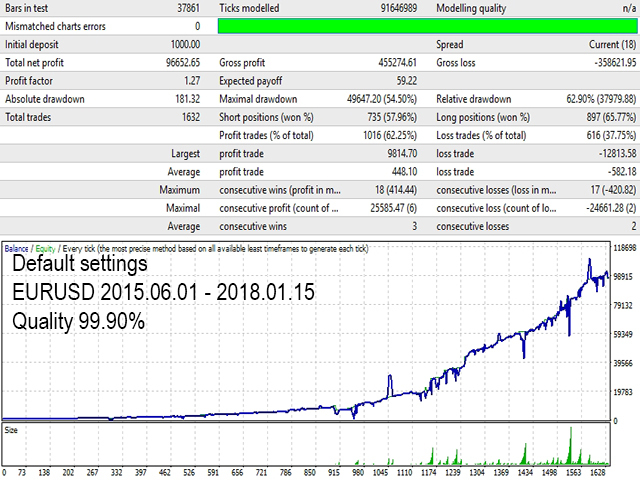 This is an automated Forex Expert Advisor. The system is based on trading in possible flat emergence zones. The EA has a built-in price movement predicting algorithm, which enables the EA to make a decision to open averaging orders or to scale an open position. Depending on parameters, it works with pending (Stop, Limit) or market orders. To diversify risks, the Expert Advisor works simultaneously with short and long positions. Their closure can be either an oppositely directed or unidirectional basket of orders. Take profit, stop loss, breakeven and trailing stop can be in pips, deposit currency or balance %. 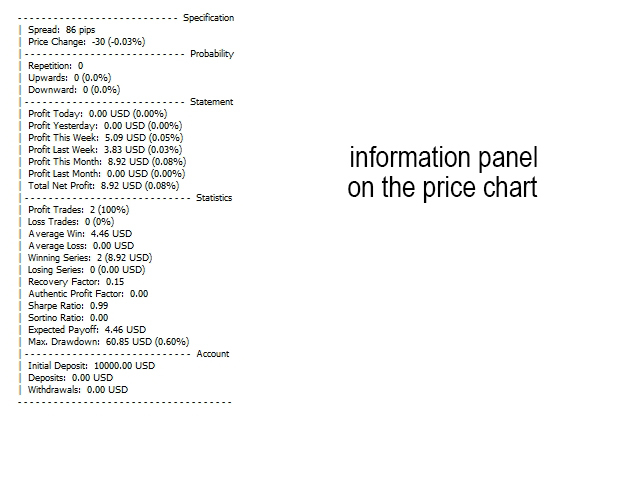 Different information is displayed on the chart to help you evaluate the efficiency of configured parameters. Signals: the price is within the specified range of High or Low prices. VPS server is recommended. The recommended minimum deposit is 1,000 units of the base currency. The EA is to be used on highly liquid currency pairs with a small spread/commission (for example, EURUSD, GBPUSD, AUDUSD, USDJPY, USDCHF, USDCAD, NZDUSD). Important! The prediction algorithm needs historic data, so you need to download quotes for at least one year before the beginning of the testing or optimization period. I.e. if you want to test this Forex trading Expert Advisor on history data for 2017, you need to additionally download quotes for 2016. You also need to understand that it is not a holy grail, it's just a program. Only you should decide when and where to use it. Before you purchase the EA, be sure to test the program in the strategy tester in the visual mode and study its settings. Please contact me if you have any questions. I hope, this product will be helpful. If you like my product, please leave your feedback. StopOrder - pending Stop orders. LimitOrder - pending Limit orders. PriceDistance - distance the price should pass within a certain time interval. MaxOpenTrades - maximum number of open orders at a time.